Takagari is the sport of falconry, long associated with Japanese nobility. 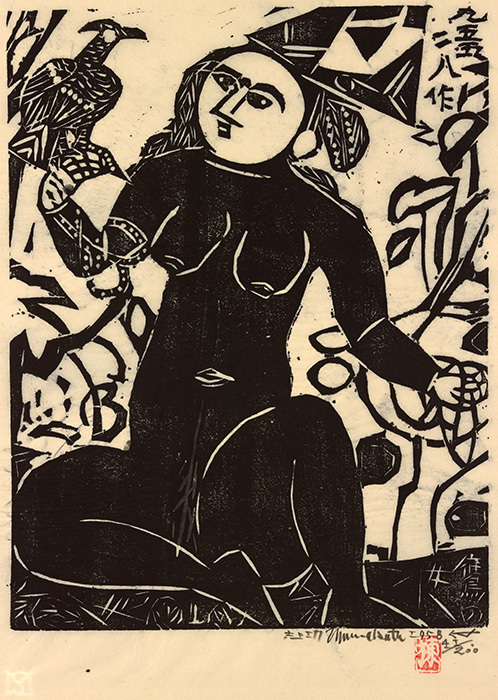 This print depicts a female falconer who meets the gaze of the hawk resting on her right hand. Munakata consistently adhered to Buddhist and Shinto subjects, often depicting female kami (Shinto deities). Believing that the work’s origin emerged from spirit of the board, Munakata worked at a swift pace, often revising the image in the midst of the carving process. Nearsighted, he often worked with his face inches away from his sharp tools. Munakata’s unorthodox process and intense, vigorous engagement with the surface lent his public demonstrations of woodblock carving the aura of a performance. Carved with a triangular chisel, the jagged, forceful lines that compose the scene generate an active, expressionistic energy. 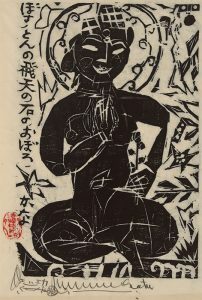 Shikō Munakata most frequently worked in monochrome, often depicting Buddhist subjects in his blocky, rough-cut prints. He tended to work quickly, and believed in allowing the material quality of the woodblock to come through. Munakata embraced his nationality, stating “When an artist strives for universality, for the width of universal appreciation, he ends up without depth, with only the superficial aspects of beauty. I don’t want to be universal. I deplore alien borrowings. I want my work to be purely Japanese.” In 1959 the artist visited the United States, when he likely made this image. Representing a hiten, or a heavenly being of Buddhism, this work references a sculpture at the Museum of Fine Arts, Boston. 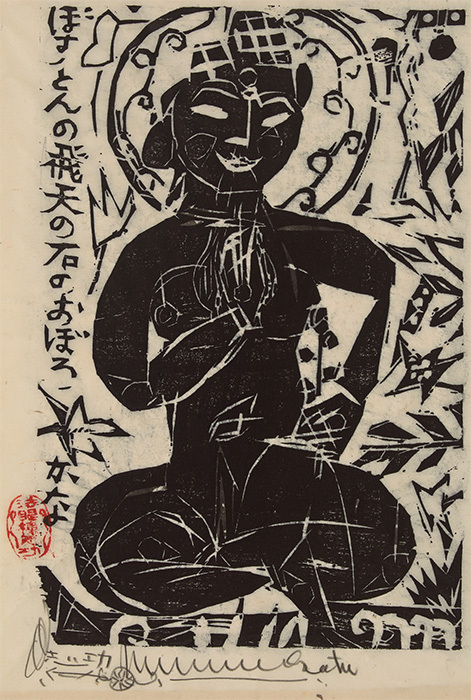 The text on the print expresses how Munakata was moved by the hiten figure, which was weathered and aged by the many places it experienced throughout its journey.